Callum Chettle in action for Posh at AFC Wimbledon. For Callum Chettle at least there is still plenty to play for in the final two matches of the League One season. 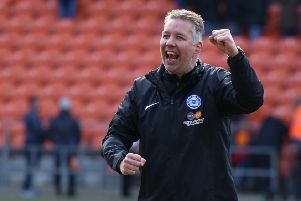 Posh might be floundering in mid-table ahead of the final home game of the season against play-off hopefuls Bristol Rovers, but there’s a lot at stake for Chettle. Posh centre-back Jack Baldwin could return after illness to face Bristol Rovers. The 20 year-old has been boosted by manager Grant McCann’s confirmation that he is part of his plans for next season and he’s determined to play a bigger role in 2017-18. Chettle’s only two League One starts of this season arrived over the Easter weekend. They were his first appearances of any sort in 2017. “It has been frustrating at times,” Chettle, who arrived at Posh from non-league Nuneaton in January, 2016, said. “But I’ve always felt the manager had faith in me. “Whenever he speaks to me he drills into me that I’m still young and that I am very much part of his plans which is great to hear. Posh centre-back Ryan Tafazolli might not play again this season. “He tells me he rates me and I want to justify his faith by kicking on next season. “I was a full-time player at Nuneaton, but the training is a lot harder at Posh obviously. This is my first season at this level and I know where I have to improve. “I need to contribute more in terms of goals and assists and that’s something I will work on for next season. “For now I just want to play in these last two matches to get more confidence about my ability to play at this level. The more games I get under my belt the better. “I know this club’s reputation for developing young players, but I don’t see the club as a stepping stone at all. “I want to help the club back into the Championship where it belongs and where the manager and chairman are determined to take it. Posh hope to have centre-back Jack Baldwin back in action against Rovers. He missed the Easter games because of illness. Centre-back Ryan Tafazolli is not expected to play again this season because of a groin problem, while midfielder Martin Samuelsen is understood to have returned to parent club West Ham United. Teenagers Lewis Freestone and Andrea Borg should be in the squad.